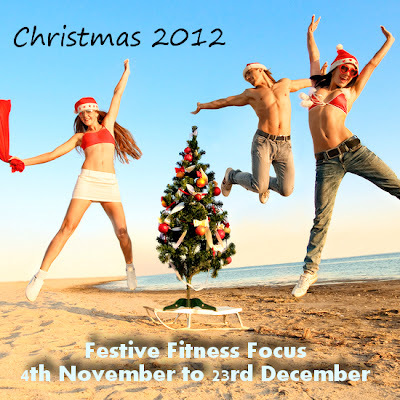 Fit to Blog: Festive Fitness Focus - Let's Do It! Festive Fitness Focus - Let's Do It! This is about setting yourself a personal challenge and sticking to it. It may be nothing like mine. Maybe you want to.. go vegan, or drink more water, or train like a warrior princess.. the possibilities are many. What would you like to change in the next 7 weeks? 20-40 minutes before breakfast or before dinner. Sugar - including dried fruit for this challenge. I eat waaay too much of it. Alcohol - one glass Friday or Saturday night. One glass a week. Just to set my mental limit - 1 glass is not more than 250ml (I say this because I have some glasses that literally hold half a bottle). The alcohol rule is very strict, because more than one glass is guaranteed to derail any other intentions in a most dramatic fashion. High-lectin foods - nuts, grains, beans, pulses (this is because my joints are playing up and reducing lectins does great things in this area - I've got a lot to say about lectins in the future, when there is time to sit down and get those posts out of my brain and onto the... blogger interface). Three meals and two snacks a day - more or less (that is, I'm aiming for mindfulness. 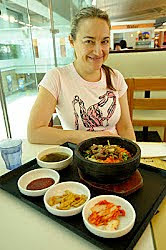 If I'm really not hungry there is no harm in skipping a meal or snack. If I'm super hungry, an extra snack is fine). Meals are vege based (or.. fruit based at breakfast). Aiming for 8-10 serves of veges a day. Calorie goal: about 1600-2000 but, I'm not counting, just guestimating (so about 400 for meals, 200 for snacks). Focus on veges, fruits, protein and healthy fats. Actually I'm very shallow and have set a weight goal. Last xmas I was 57.5 kg. This year, I want to be under 57 kg on the morning of the 23rd. So that's 1.7kg (approx 4lbs) to lose in 7 weeks. If I can't do that, I haven't tried hard enough. If so, grab the graphic (or email me for it), and link up your own Festive Fitness Focus post in the comments. State what you personally are committing to (you can do this in the comments or on your blog). It will be different for everyone, and the readers of Fit to Blog are a diverse bunch, that's for sure.. ;D I'll amend this post on Sunday to include a list of all bloggers that are involved (or link up your Facebook page or Twitter if you are not blogging). My goals are definitely strength & yoga related... I really want to build up the strength in my arms/shoulders and get into a few more asanas that are challenging me at the minute. Woohoo! That looks great! Go us! I am keen! I want to weigh 70kg +\- .5 kg. I am currently 75.5kg and there are no surprises there as I have been gorging on alcohol and sugar and refined products over winter. To help me I am doing Whole 30 for month of November. So pretty much eating the same as you Sara. In December I will continue to eat like this but with some free meals thrown in and the odd glass of alcohol. The thing I am worried about is it talks about how it turns your body from burning carbs to fat, which while I'm cool with in the long run, am worried how it will affect my sporting performance ie bball. I guess time will tell. Fitness wise I want to get super cardio fit for my basketball tournament coming up in Feb. I plan to do 3-4 sessions of 20 minute BFL intervals, plus two games of bball a week. I also got the Insanity DVDs which I find awesome, but hard to commit to 6 sessions a week on top of everything else but I certainly noticed a big difference in my strength, fitness, weight and well being when I did two weeks of it. I will commit to doing 3 times a week, probably either side of 20 interval training. This is the fitness plan, but I am flexible and keen to see what works or what doesn't. Yay! Do you have a blog? If not I'll be doing check in posts a couple of times a week. Can send you a spreadsheet if you like, and I'll host it online. Email me. OK, I'm in too. I'll have to think some more about what I'm going to commit to. I'm definitely doing my PedalTek sessions each Thursday night - I've got 6 more weeks to go, then I can substitute Sufferfest instead for the rest of the weeks.